At the time of Flodden, 600 soldiers were garrisoned in Berwick upon Tweed, treble the normal strength. This was as protection for the strategically important but vulnerable port and to guard against a possible Scots rearguard action. At this time, the soldiers mustered on Wallace Green - just in front of where the 18th Century Barracks is situated. The captured Scottish artillery guns - the Seven Sisters - were stored at “the King’s Garners” on or near this site. After the battle, the body of James IV was brought to Berwick for embalming before being taken south for burial. While most of the fortifications and defences visible today were built after Flodden they generally follow the line of the medieval walls. Lord’s Mount (above), a great artillery fortification with 20ft thick walls, was built at the northeast corner of the medieval defences. King Henry VIII took a personal interest in the design of these defences. The battle of Carham in 1018 resulted in Malcolm II of Scotland claiming the Tweed as the boundary of his kingdom. Although there is no documentary reference to Berwick in this context, this would have given it strategic importance, and may have prompted its development as a frontier stronghold as well as a harbour. By the reign of David I in the twelfth century, Berwick had become a town and was given the status of a Royal Burgh. Its importance was probably principally as a major port; its function as a frontier town was doubtless secondary at this time. The three main churches, Holy Trinity, St Mary’s and St Laurence’s in Bondington were all built by the twelfth century. The monasteries of Kelso, Melrose and Coldingham were given extensive properties in the town; two nunneries and probably two hospitals were founded before the end of the century. In 1174 the Castle and town were handed over to the English in exchange for the release of William I, and in 1189 were returned to Scotland by Richard I in exchange for a large sum of money. The thirteenth century, and in particular the reign of Alexander III (1249-86), marked the peak of Berwick’s importance and prosperity. The town centre became more densely populated and was organised into streets. All the friaries and the remaining hospitals were established and foreign trading communities, such as the Flemish merchants of the Red Hall, were set up. The port carried most of the import and export trade of Scotland and, by the end of Alexander III’s reign, paid £2,190 into the Scottish Exchequer in customs dues annually. 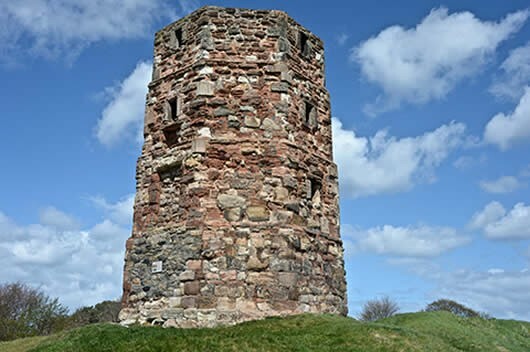 Its importance to Scotland is also indicated by the amount of time spent there by successive Scottish Kings up to its capture by the English in 1296. In 1216 the town was captured and burnt by King John, but subsequently abandoned to the Scots. It seems to have recovered rapidly, and continued to grow in prosperity. Accounts of the capture of the town by Edward I in 1296, however, record that the majority of the population was killed or died in the fire as the town was burnt. Estimates of the numbers of dead vary from 7,500 to 15,000. Allowing for exaggeration, this still indicates a population of several thousands, much larger than at the end of the middle Ages. As the English interest in it was purely military, the town did not recover its prosperity during the medieval period. It was too far north to be any use as a port for foreign trade, and trade with Scotland was curtailed in the interests of security. The town now became first and foremost a frontier stronghold, with defences begun by Edward I and completed by the Bruces after the Scottish re-possession of the town in 1318. The English regained the town in 1333. After each siege and battle for the town there are accounts of re-allocation of land, of empty properties, and damage requiring repair. For the century after the capture of the town in 1333, the towns-people were responsible for the upkeep of the defences, but seem to have neglected their responsibility. Capture of the town by the Scots for brief periods in 1335, 1384 and 1405 must have contributed to the dereliction, but the poverty of the Burgh was probably the major contributory factor in this decline. In 1459 Henry VI, escaping to Scotland, gave Berwick to the Scots, who attempted to repair the defences; but the town was destitute. In 1482 Edward IV recaptured Berwick. Extensive damage caused by the siege was immediately repaired, while a joint Scottish and English commission was set up to determine the frontier. By Henry VIII’s reign the defences were so dilapidated as to be virtually useless; this was probably symptomatic of the state of the town as a whole. During the reigns of Edward VI, Mary and Elizabeth, new defences were constructed and the castle abandoned as the defensive structure. The line of the new rampart was decided on purely military grounds. It excluded the north-west part of the medieval town and the main church, and involved the demolition of private property on quite a large scale. All of these facts confirm the decline in numbers and morale of the population. At the time of Flodden, 600 soldiers were garrisoned in Berwick upon Tweed, treble the normal strength. This was as protection for the strategically important but vulnerable port and to guard against a possible Scots rearguard action. At this time, the soldiers mustered on Wallace Green - just in front of where the 18th Century Barracks is situated. The captured Scottish artillery guns - the Seven Sisters - were stored at “the King’s Garners” on or near this site. After the battle, the body of James IV was brought to Berwick for embalming before being taken south for burial. While most of the fortifications and defences visible today were built after Flodden they generally follow the line of the medieval walls. Lord’s Mount (above), a great artillery fortification with 20ft thick walls was built at the north-east corner of the medieval defences. King Henry VIII took a personal interest in the design of these defences. In 1565 the population, excluding the garrison and men working on the fortifications, was only about 1,500 (Scott). Such was the decayed state of the town that a list of articles for its surety in 1552 included recommendations to repair public buildings which were derelict, and pave the streets which had become impassable to the garrison. The withdrawal of the garrison by James VI and I in 1603 must have further depressed the economy of the town. Two major achievements of the seventeenth century were the building of the Berwick Bridge and the Holy Trinity Church, provided largely by state funds, and, in the case of Holy Trinity, by using stone from the castle which was demolished for this purpose. The general picture is of a continuing state of decay until the latter part of the century when trade revived. By the beginning of the eighteenth century Berwick seems to have regained its prosperity and much of the town was rebuilt. 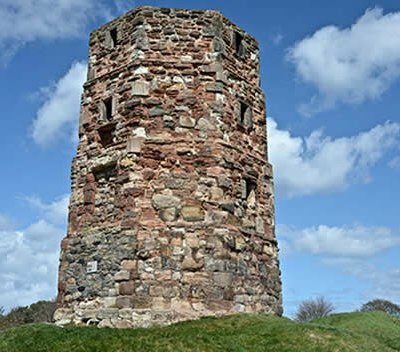 NB - The Berwick walls, medieval bell-tower, and the castle ruins, are free, un-manned sites which are open all year round, 24 hours a day (please note - there are no facilities at any of these). Please call into the local Tourist Information Centre for a map showing their locations. Toilets, including accessible facilities for wheelchair users. Shop. Tea/coffee vending machine. Picnic area. Baby Changing facilities. Activities for children. Dogs welcome. Ground floor access only for wheelchair users. Berwick Barracks is situated on Parade, just off Church Street in the town centre. There is a regular bus service from surrounding towns. The town is on the East Coast main line, with frequent trains from Newcastle-upon-Tyne and Edinburgh.